Exercise 28 Aim: To study the effect of pH on the action of salivary amylase. Principle: Optimal activity for most of the enzymes is generally observed between pH 5.0 and 9.0. However, a few enzymes, e.g., pepsin are active at pH values well outside this range. Above and below this range, the reaction rate reduces as enzymes get denaturated. Requirement: Glass wares: test tubes, beakers, dropper, funnel; Chemicals: NaCl, Na2HPO4, KH2PO4, iodine crystals, potassium iodide, Buffer solutions of pH 4 and 9, Equipments: water bath or oven, thermometer; Miscellaneous: cotton, rubber, distilled water. Preparation of reagents • Buffer solutions of pH 4 and 9 can be prepared by dissolving buffer tablets in appropriate amount of distilled water as indicated on the paper. The first four initial steps are the same as in previous Experiment 26. • Prepare three sets of indicator test tubes (8 to 10 in each set) in three separate test tube stands. Label test tube stands as A (for 6.8 pH), B (for 4 pH) and C (for 9 pH). In each test tube take 0.5 ml of iodine solution. • In a test tube, take 5 ml of 1% starch solution, 1 ml of 1% NaCl solution and 1 ml of pH 6.8 buffer solution, mark it as control tube or A. In a second test tube, take 5 ml of 1% starch solution, 1 ml of 1% NaCl solution and 1 ml of pH 4 buffer solutions, mark it as experimental tube 'B'. In a third test tube, take 5 ml of 1% starch solution. 1 ml of 1% iodine solution and 1 ml of pH 9 buffer solution. Mark it as experimental tube 'C'. • Transfer 1 ml of dilute saliva into each test tube and mix the two thoroughly. Place all three test tubes in water bath set at 370C. • Take a drop from each of the experimental tubes with the help of dropper and add to the corresponding indicator tubes containing iodine solution. Note this time as zero minute reading. • At intervals of every 2 minutes repeat the above steps and note the change in colour of iodine solution. Continue this till the colour of iodine does not change. Exercise 28 • Note the time taken for different experimental tubes till they do not give any colour with iodine. Time minute Tube 'A' Tube 'B' Tube 'B' 0 Blue colour Blue colour Blue colour 2 _________ _________ ________ 4 _________ _________ ________ ____ _________ _________ ________ ____ _________ _________ ________ Calculate the time taken to reach the achromatic point in tubes A, B and C. Find out whether in any of the three tubes achromatic point was not observed. On the basis of following questions draw your conclusion: • At which pH is the reaction optimum? • Did all three sets of tubes reach achromatic point? If not, why so? • What inference do you draw about enzyme activity from your experiment? Exercise 29 Aim: To detect the presence of urea in the given sample of urine. Principle: Urea is mainly excreted into urine via kidneys. The nitrogen of amino acids is removed as urea. Normally a healthy adult person excretes about 15g of nitrogen per day; 95% of this nitrogen is excreted as urinary urea. The amino groups of amino acids are ultimately removed as ammonia (NH3). This NH3, is highly toxic, and is ultimately converted into urea. Normally urine is acidic. If the urine is kept exposed to atmosphere, it splits and ammonia gets released and thus the stored urine becomes alkaline. At optimum pH and temperature urease enzyme decomposes urea into ammonia and carbon dioxide which form ammonium carbonate (an alkaline substance). which changes the slightly acidic solution to alkaline solution. When phenol red is used as indicator in this reaction mixture, the colour of solution changes from yellow to pink. Requirement: Glasswares: test tubes, Chemicals: 2% Na2CO3 solution, 2% acetic acid, sodium hypobromite, sodium hydroxide, 1% acetic acid, urease tablet, phenol red, dilute NaOH solution, 1% CuSO4 Solution Equipments: test tube holder, test tube stand, spirit lamp. (a) Urease test • Take 2 mL of urine in one test tube and 2 mL of water in the other. • Add a drop of phenol red indicator to each tube. • Add 2% Na2CO3 solution drop by drop till the pink colour develops in both test tubes (just alkaline). • Now add 2% acetic acid to each test tube drop by drop till the pink colour disappears (just acidic). • Add a pinch of soybean powder (contains the enzyme urease) or a pinch of urease enzyme powder to each test tube and rotate the tubes between the palms or warm both the tubes to about 60oC. Overheating should be avoided to prevent denaturation of enzyme. • The pink colour appears in the tube containing urine but not in the other tube containing water. Exercise 29 The enzyme urease acting on urea releases ammonia as shown in the following reaction: (NH2)2 CO Urease (NH4)2CO3 heating2NH3 + H2CO3 Urea NaCOAmmonium2	3 (neutral) carbonate +H2O (alkaline) NHOH4This test is a specific test for urea because the enzyme urease shows its specificity for the substrate urea. The optimum pH (just acidic) and temperature (600C) must be maintained for the activity of the enzyme urease. Urea is formed in the liver from ammonia and carbon dioxide. Ammonia is the product of deamination of amino acids. Therefore, urea excretion in urine is dependent on the amount of protein ingested. Note: In place of Soyabean powder or urease enzyme, the aqueous extract of Cajanus cajan (Arhar) can also be used as a source of urease. (b) Biuret test • Place a small amount of urea in a dry test tube and heat it on a low flame. Urea melts with the liberation of ammonia. • On further heating it solidifies (in case of urine, the urine is heated till it is completely evaporated). • Cool the tube. Add 3mL of water and shake. • Add to it 1mL of dilute NaOH and 1 or 2 drops of 1% CuSO4 solution. The pink colour develops indicating the presence of urea. Excess drops of CuSO4 should not be added, otherwise CuSO4 will form Cu(OH)2 with NaOH forming a blue colour. This is sometimes mistaken for a positive Biuret test. Urea when heated decomposes with the liberation of ammonia and the formation of biuret. The biuret is dissolved in water and develops a pink/ violet colour forming a complex with the alkaline copper sulphate solution. (c) Sodium hypobromite test • To the 2 mL of the given sample of urine in a test tube, add 2 drops of alkaline sodium hypobromite solution. • Brisk effervescence of nitrogen appears in the test tube which indicates presence of urea in the sample. 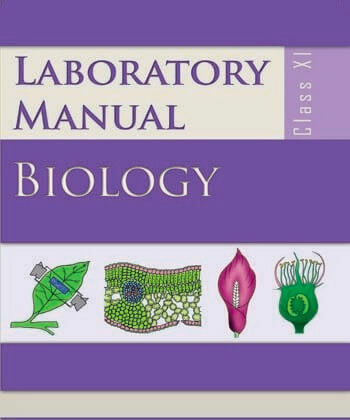 Laboratory Manual: Biology When urine is treated with sodium hypobromite solution containing excess of sodium hydroxide, the carbon dioxide and nitrogen gas are evolved. CO2 after reacting with NaOH gives Na HCO.3(NH) CO + NaH Br CO + N + NaBr + H22222 urea +NaOH NaHCO3 Exercise 30 Aim: To test the presence of sugar in the given sample of urine. Principle: In normal urine, practically there is no glucose. Presence of glucose in urine is called glucosuria. To detect reducing sugars, such as glucose, fructose etc. in urine Benedict's or Fehling's tests are done. CuSO4 present in Benedict's solution or Fehling's solution is reduced on boiling by the reducing substances (glucose, fructose etc.) to form the coloured precipitate of cuprous oxide. The light green, green, yellow and brick red precipitates of cuprous oxides depend on the concentration of reducing substances present in urine. Glucose reduces the blue cupric sulphateof Benedict's reagent or Fehling's reagent to a coloured insoluble precipitate. CH2OH(CHOH)4 CHO+2Cu++ SO4 +2H2O heatingGlucose Cupric sulphate (reducing sugar) (blue solution) CH2OH(CHOH)4 COOH + Cu2O + 4H+ + SO4 Gluconic acid cuprous oxide (oxidised sugar) (red precipitate) Requirement: Glasswares: Test tubes, beakers, spirit lamp, pipette; Chemicals: Benedict's solution, Fehling's solution A and B, Seliwanoff's reagent, Miscellaneous: Test tube holder, test tube stand, urine sample. (i) Benedict's reagent Mix: 173 g of sodium citrate and 100 g of anhydrous sodium carbonate in 600 mL of water in a beaker and warm gently (solution A). Dissolve 17.3 g of hydrated CuSO4 in 100 mL of distilled water (solution B). Add solution B to solution A with constant stirring. Cool and transfer to a one litre flask and make upto the mark with water. (ii) Fehling's reagent A: Dissolve 6.93 g of copper sulphate in 100 mL of distilled water. (iii) Fehling's reagent B: 20 g of KOH and 34.6 g of sodium-potassium tartarate (Rochelle’s salt) dissolved in 100 mL of distilled water. Laboratory Manual: Biology (iv) Seliwanoff's reagent: Dissolve 50 mg of resorcinol in 33 mL of concentrated hydrochloric acid and dilute it to 100 mL with distilled water. (v) In absence of appropriate samples containing abnormal components of urine, these components (glucose, albumin) can be added in the normal urine sample. (a) Benedict's test • Take 5 mL of Benedict's reagent in a test tube. Add 0.5 mL (8 drops) of freshly passed urine to it. • Boil for 2 minutes holding the test tube firmly with a test tube holder (during boiling, the contents of the test tube get a tendency to spurt out. Hence, it is wise to keep shaking the test tube after holding it in the inclined position near the flame to avoid cause overboiling). • A light green, green, yellow and brick red precipitate indicates the presence of reducing substances in urine. • The various coloured precipitates depend on the concentration of reducing sugars in urine which gives a rough estimate of the concentration given below: (b) Fehling's test • Take equal volumes (2 mL) of Fehling's solution A and B in a test tube. Mix them well. • Add the above solution drop wise to 1 mL of urine sample taken in a test tube. Heat the test tube after each drop is added. • A yellow or orange or brick red precipitate is formed which indicates the presence of reducing sugar in urine. Colour o f precipitate % of reducing suger present Light green Green Yellow Brick red ------------------- 0.1 to 0.5 0.5 to 1.0 1.0 to 2.0 above 2 Exercise 30 Note: Benedict's and Fehling’s test are not necessarily indicative of only glucose in urine but it may also indicates the presence of other reducing sugars, such as lactose (in case of pregnant woman and lactating mothers), fructose (in fructosuria), galactose (in galactosuria), homogentisic acid (in alkaptonuria), glucuronates and mucin. (c) Seliwanoff's test The qualitative Benedict's test is not very specific test for glucose, since other reducing sugars also give positive tests, such as fructose, galactose, lactose, maltose, pentose. Other urinary constituents, drugs and contaminants in the urine may give false positive results. For detecting whether glucose or fructose is present in the urine, Seliwanoff's test should be performed. This test is to be performed when urine sample gives positive test for Benedict's or Fehling's test. • Take 3 mL of Seliwanoff's reagent and add 1 mL of urine sample. • Boil for two minutes. Appearance of red to orange colour indicates the presence of fructose. • If no colour appears in 2 minutes, continue boiling for 5 minutes. • If faint orange or no colour appears, then it indicates the presence of glucose. Test is sensitive between 50-80 mg glucose/100 mL urine. Less than this amount in the urine will not be detected by this test.